Winter, F.; Ahrens, J.; Spors, S. (2018): “A Geometric Model for Spatial Aliasing in Wave Field Synthesis.” In: German Annual Conference on Acoustics (DAGA). 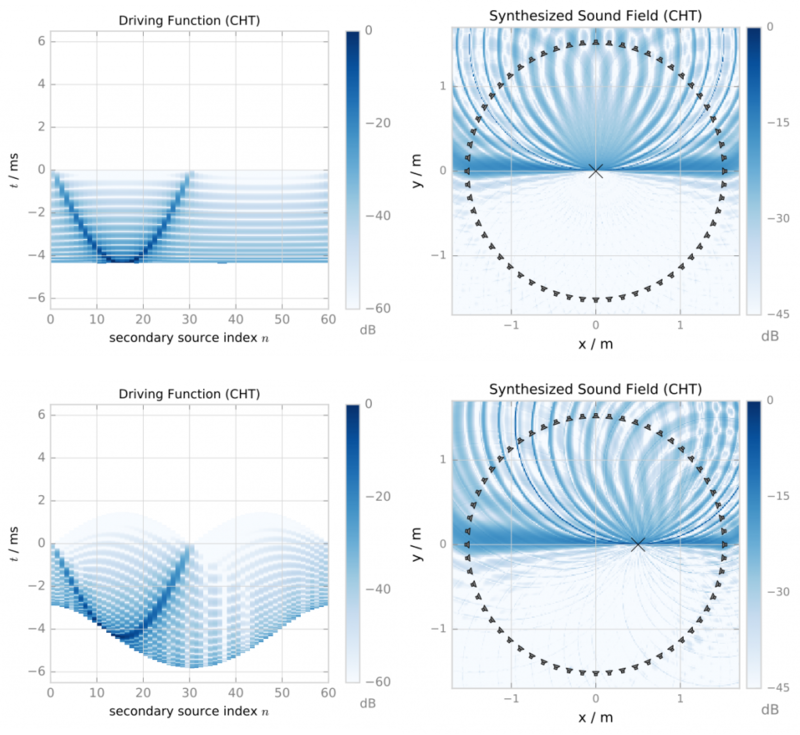 Wave Field Synthesis aims at a physically accurate synthesis of a desired sound field inside a target region. Typically, the region is surrounded by a finite number of discrete loudspeakers. For practical loudspeaker setups, this spatial sampling causes spatial aliasing artefacts and does not allow for an accurate synthesis over the entire audible frequency range. In the past, different theoretical treatises of the spatial sampling process for simple loudspeaker geometries, e.g. 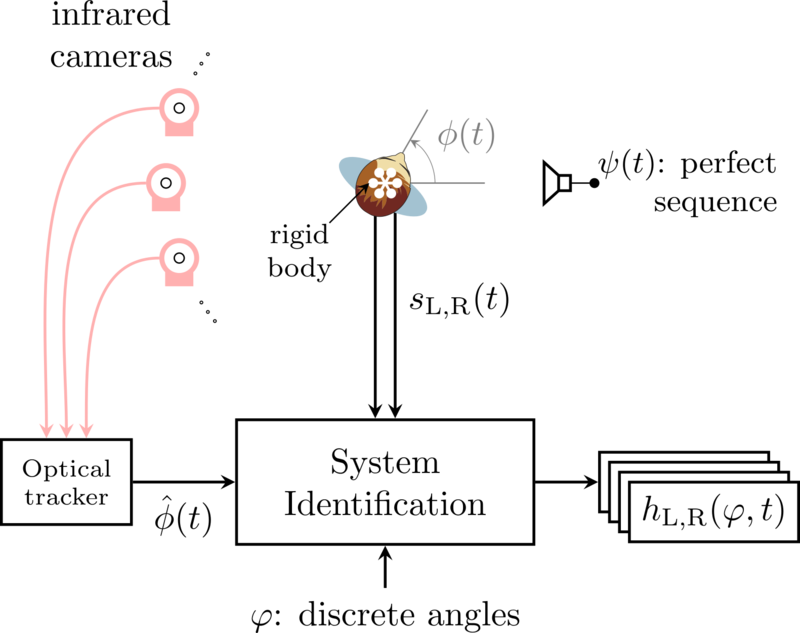 lines and circles, led to anti-aliasing criteria independent of listener’s position inside a target region. However, no inference about the spatial phenotype of the aliasing artefacts could be made by this models. This work presents a geometrical model based on high-frequency approximations of the underlying theory to describe the spatial occurrence and the propagation direction of the additional wave fronts caused by spatial aliasing. Combined with a ray-tracing algorithm, it can be used to predict position-dependent spatial aliasing artefacts for any convex loudspeaker geometry. A new version of our Sound Field Synthesis Toolbox for Matlab/Octave is available. This is a minor update fixing some bugs and adding support for mono-frequent simulations of local Wave Field Synthesis (LWFS) using spatial bandwidth-limitation. Hahn, N.; Hahne, W.; Spors, S. (2017): “Dynamic Measurement of Binaural Room Impulse Responses Using an Optical Tracking System” In: Proc. Int. Conf. Spatial Audio (ICSA), Graz, Austria. Winter, F.; Hahn, N; Spors, S. (2017): “Time-Domain Realisation of Model-Based Rendering for 2.5D Local Wave Field Synthesis Using Spatial Bandwidth-Limitation.” In: Proc. of the 25th European Signal Processing Conference (EUSIPCO), 2017. The slides and additional material can be found here. Wave Field Synthesis aims at a physically accurate synthesis of a desired sound field inside an extended listening area. This area is surrounded by loudspeakers individually driven by their respective driving signal. Recently, the authors have published an approach for so-called Local Wave Field Synthesis which enhances the reproduction accuracy in a limited region by applying a spatial bandwidth limitation in the circular/spherical harmonics domain to the desired sound field. This paper presents an efficient time-domain realisation of the mentioned approach for 2.5-dimensional synthesis scenarios. 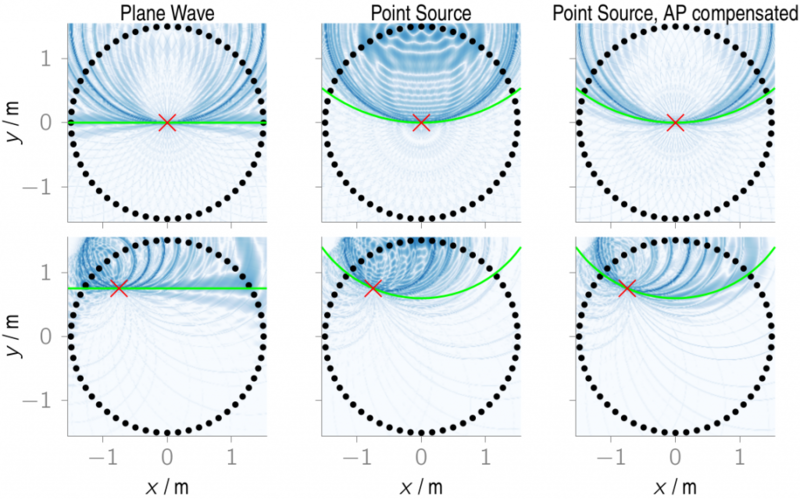 It focuses on the model-based rendering of virtual plane waves and point sources. 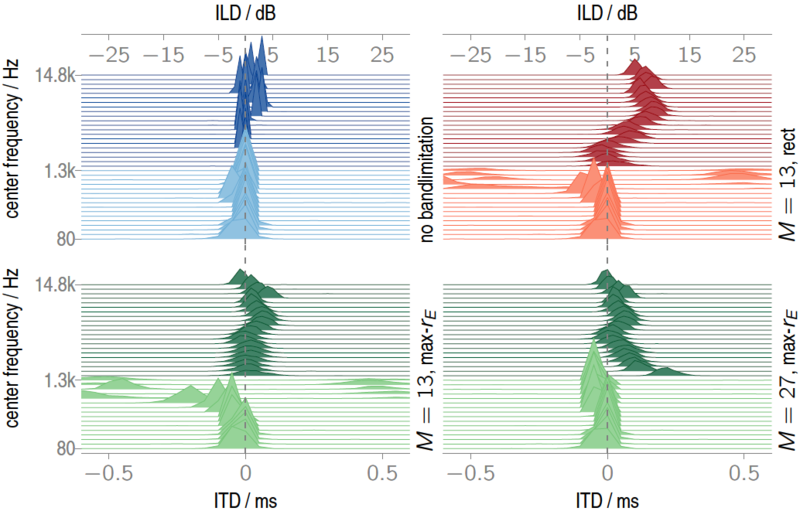 As an outcome, the parametric representation of the driving signals for both source types allows for the reproduction of time-varying acoustic scenarios. This also includes an adaptation to the tracked position of a moving listener. The realisation is compared with conventional Wave Field Synthesis regarding the spatial structure and spectral properties of the reproduced sound field. The results confirm the findings of the prior publication, that the reproduction accuracy can be locally improved with Local Wave Field Synthesis. Fix the calculation of zeros of the spherical Bessel function for high orders as needed for NFC-HOA. 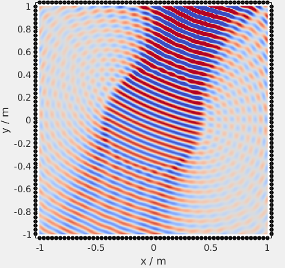 After the recent paper by N. Hahn and S. Spors we managed to get rid of numerical instabilities for orders higher than 80 by using a similar implementation as provided by scipy. To demonstrate the advantage of the new implementation we have a look at the NFC-HOA part of Fig. 3.14 from Wierstorf (2014). The first version of the figure shows the sound pressure of a cosine shaped impulse synthesized as a plane wave by NFC-HOA. NFC-HOA was realized with an order of 256 for a continuous (approximated by 500 sources) distribution of secondary sources and for one with 64 secondary sources. You can clearly see some numerical noise on the signal. In the area where the signal is not shown, but replaced by the two labels “numercially unstable” the signal starts to oscillate with very high amplitudes. 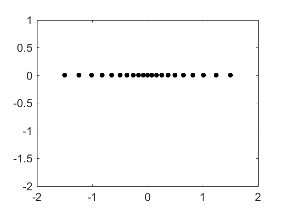 The second version of the figure presents exactly the same numerical simulation, but now applying the version 2.4 with the new implementation of sphbesselh_zeros(), for which numerical problems are no longer an issue for the applied order of 256. 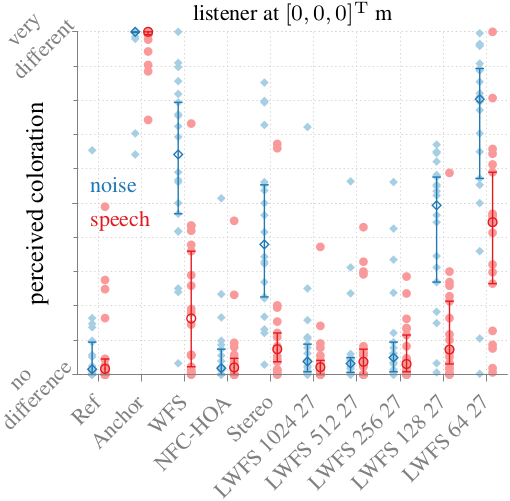 Local Wave Field Synthesis (LWFS) using spatial bandwidth-limitation may be used to reduce spatial aliasing artifacts in a prioritized region. It will be presented at WASPAA 2017, that this leads to a perceivable reduction of coloration. The details of the Time-Domain Implementation of this LWFS technique where presented at EUSIPCO 2017. Add max-rE, Tukey and Kaiser weighting to the modal window. The Tukey and Kaiser windows can be parameterized and allow an investigation of the influence of the modal window on the sound field as done for a recent talk a the Acoustics’17. The max-rE weighting is popular within the Ambisonics community. To see the windows in action have a look at the new section in the documentation on modal weighting. Download the SFS Toolbox 2.4.0 and have a look at the online documentation how to use it.